I'm Kate Luella and I'm a Digital Strategist (ie someone who thinks in terms of a “digital sales funnel”) not just a website designer. A Digital Strategist designs and builds digital strategies to achieve more sales and profit for businesses including high-converting websites. The reality is that the term “digital strategy” actually lends itself to a wider purpose for businesses – a more expansive purpose than what I do. So I really consider myself to be a Digital Marketing Strategist. -Did you pay for a website years ago and now it’s outdated and you want to know what’s the best website for your business in today’s market? -Or are you are starting from scratch with your web design and you want to know how to build a brilliant website the first time and have no regrets later that you didn’t get the right website in the first place? -Or maybe your current website has not performed as well as you were told it would, and you want the facts before you move onto another website? After you have read through this book and referenced your business model to the training along the way (eg. 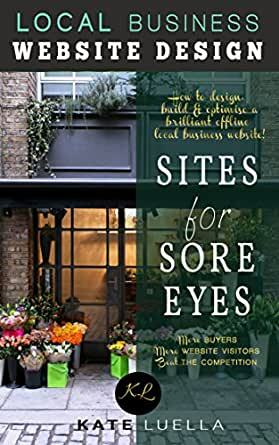 a retail shop, a repair business, a manufacturer etc), then you will find yourself armed with the RIGHT information to go on and create the BEST possible website for your business and you don’t need to worry about building or buying a lemon. I’ve had the privilege of assisting many local offline businesses (of differing sizes) going forward with their customised digital strategies, helping them change the financial direction of their business for the better as a direct result of an online marketing campaign that I designed. I hope this book servers you well too!